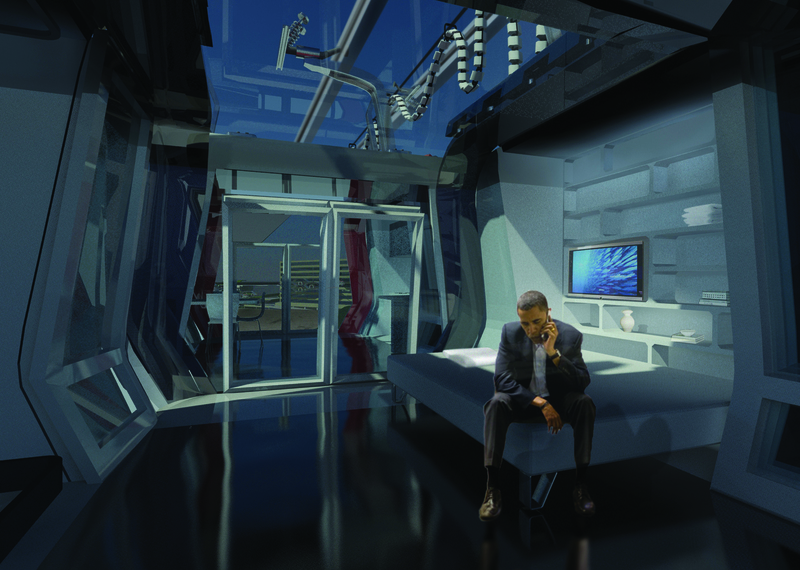 Gondola-housing explores the meaning of urban space as a commodity. The project examines a variety of urban archetypes condominium and office towers, parking lots, private homes, public housing and reveals the opportunities to optimize their use of space. 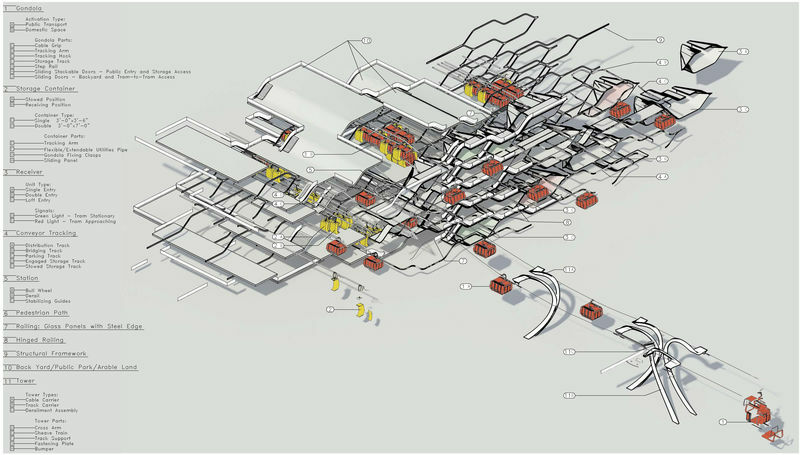 The idea is a practical separation of space and utilities for the sake of the efficient use of structure. No space is private for any longer than it needs to be. When not in use, the space module, the gondola, is lease out as a transportation pod or as desired program space to the different archetypes in question. The main exporter of space is a housing block, which stands in a parasitic or free structure. This structure supports parkland platforms that are open to the public when any or all of the gondola-housing units are cleared. 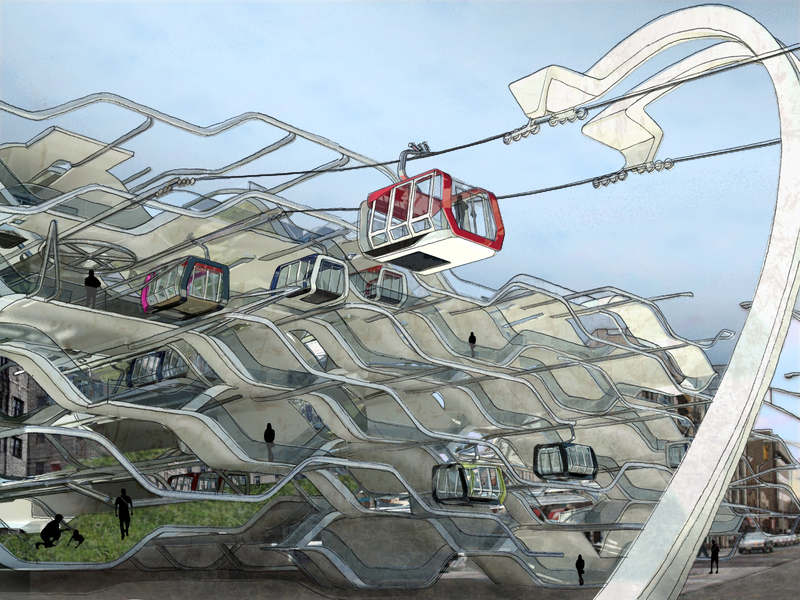 Taking the example of the zip car, a project that relabeled the car as public property and gave an economic model to this effect, gondola-housing renders ephemeral the line between private and public in two scales: the domestic and the urban. The gondola is, thus, not only a mode of light transport; it insists on reconnecting the city back to itself by creating a network of local exchanges of space and activity. This exchange effectively revitalizes and stabilizes the local economy, supporting the main hub as public housing, helping private homes ward off foreclosures, and providing people with a safe, cheap, and humane transportation. Existing urban applications of the gondola system as public transportation are proven to be more flexible, cheap, and socially advantageous than others. When compared by initial capital investment, operating cost and time of installation, aerial trams win out as the cheapest mode of public transportation. The lack of urban character but consistent density in Jersey City situate the challenge we pose to infrastructure in its adaptability to different but generic urban archetypes: parking lots, office buildings, private homes, and condominium towers. In its most acclaimed instance, the gondola system in Medellin, Columbia has prompted urban renewal, exemplified by painted and decorated roofs and terraces. The system connects downtown Medellin to the slums over the hill. It has brought cheap transportation to a community that otherwise could not afford it (less than $1 a ride). In New York City, Roosevelt Island is accessible by means of a 125 person aerial tram. Commuters depend on this direct service to the MTA on a daily basis. For both of these systems, the primary consideration was the existing built environment. The infrastructural intervention is minimal in footprint and meets the geographical flexibility required in these two applications. 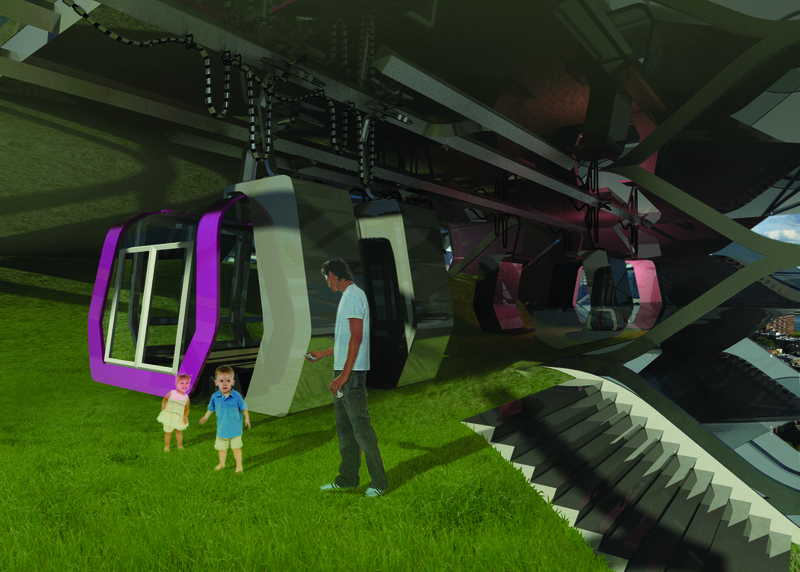 As infrastructure, the gondola system is essentially a tool for urban space exploration as a means to both arrive at and create urban activity. 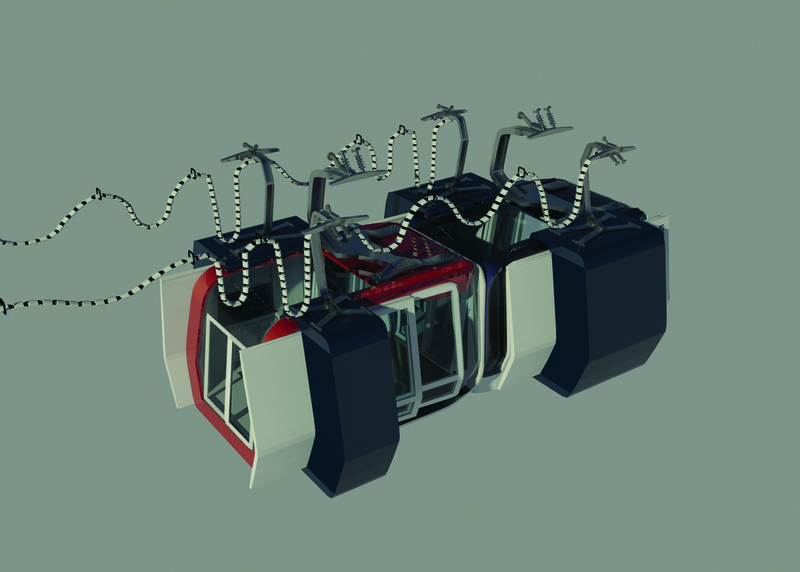 Gondola Housing exploits the flexibility of movement inherent to aerial tram systems by means of an architectural reinterpretation. Gondolas are able to follow different cable lengths at high speeds and can achieve vertical movement with quite simple tracking systems. When space becomes an exchangeable commodity, its use is refined and attuned to location and time of need. 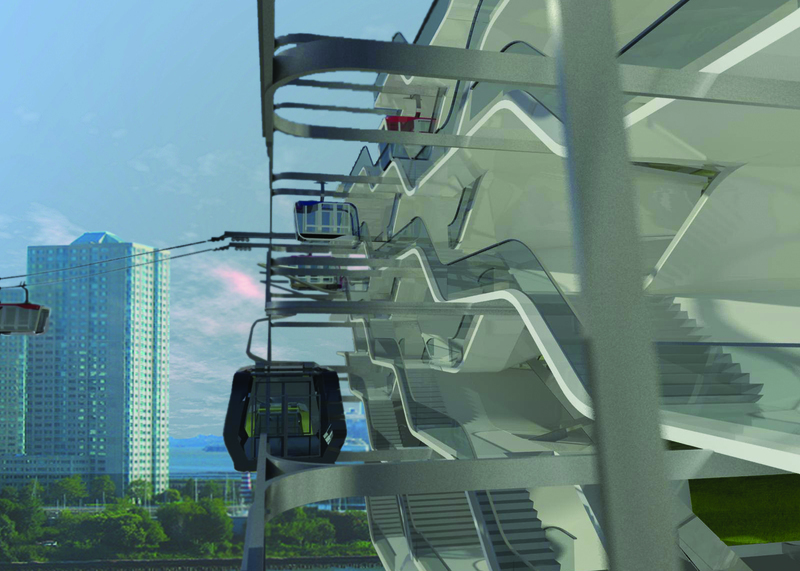 Since the gondola system is so cheap and quick to install, it will easily be stretched to satisfy varying needs throughout the city. 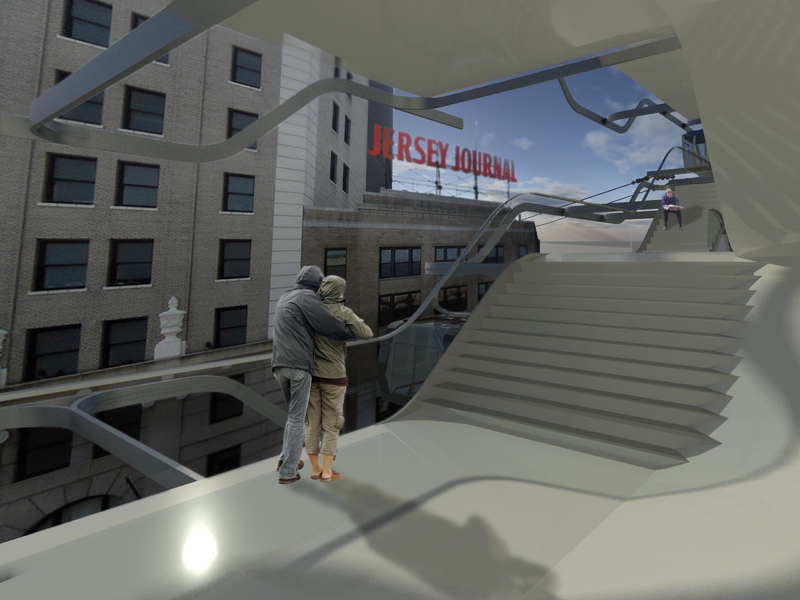 The viral spread would only reinforce the system’s socioeconomic agenda of reconnecting Jersey City to itself and addressing local needs. Successful infrastructure must align itself with and take part in every aspect of the city, and most importantly, at the scale of the urban domestic space. A significant amount of space is wasted over time while waiting to be used for its singular purpose. Gondola Housing is rooted in the appropriate combination of space and utilities to produce activity specific to its time of need. The model is a consolidation of economic and spatial efficiencies and specificities of the Zip Car and Self-Storage. These services give users the choice of the size of container/car they need, where they need it and for a particular time frame. 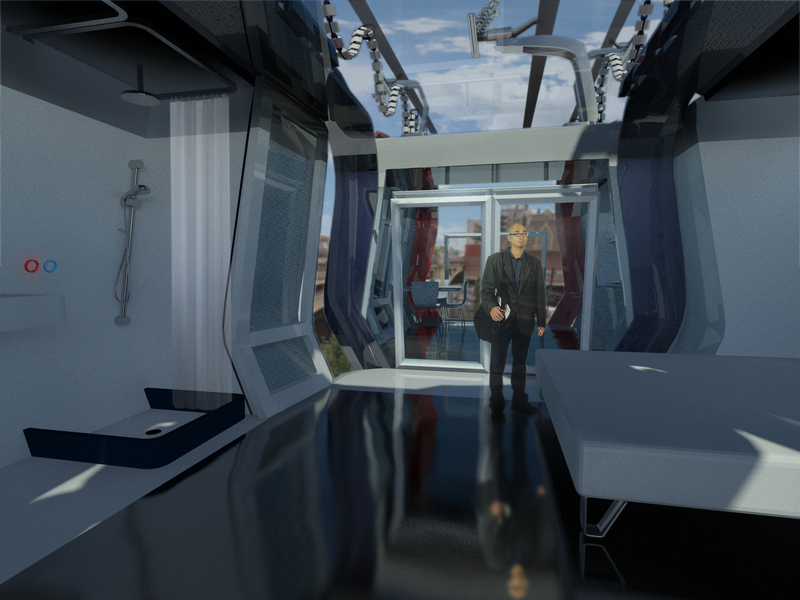 Customization is the key to the success of these systems, and Gondola Housing takes their merits into the urban dweller’s daily life. 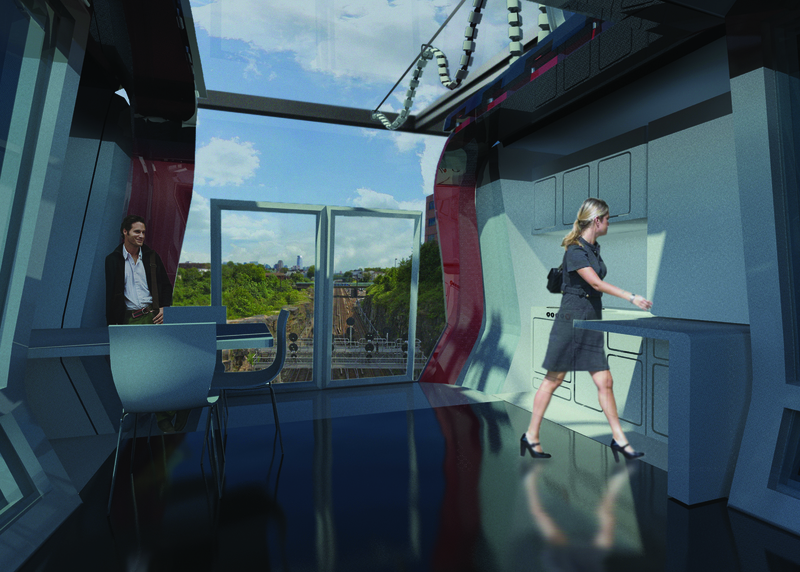 In order to give people the option to pay for space only when they use it, Gondola Housing isolates space from the utilities that activate it, allowing for a constantly changing formula: space + container (with shower, appliances and/or furniture) = activity (sleeping, eating, working, etc.) The containers are semi-permanent, as they are leased for longer periods of time and are never shared between households (self-storage). 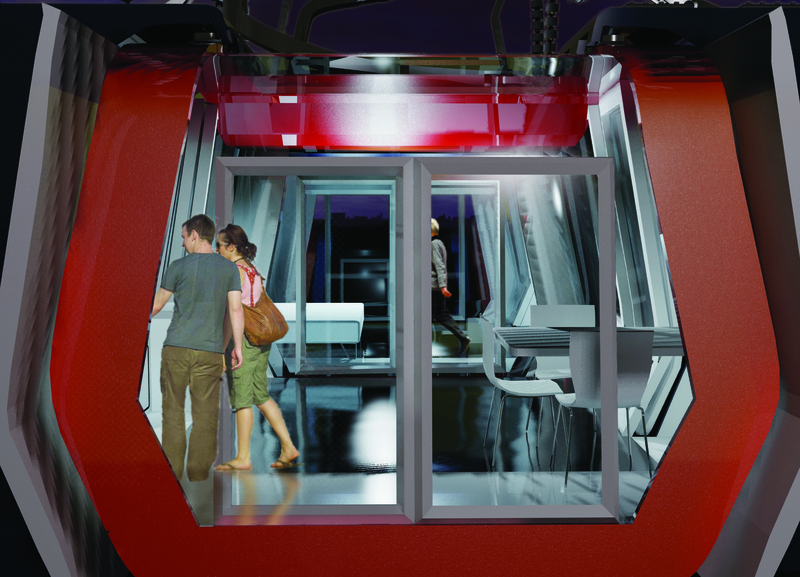 Gondolas are constantly exchanged, both within the household to accommodate as many uses with as few space modules as possible and between households (Zip Car).Essentially, people only own shares in urban space that they constantly exchange in order to be more in control of their private finances, as well as to increase the frequency of space being public. The structure is modular and expandable. Its geometry is derived from the movement of the gondola up, down and across the facade. The tracking system is flexible, allowing for various lengths of personal tracks, and thus different unit sizes, to be located virtually anywhere along the main distribution track. Cable derailment stations are integral to the structure. The main exporter of space is the housing block, which would either be a freestanding structure or a parasitic one on top of an existing structure, such as a parking lot. 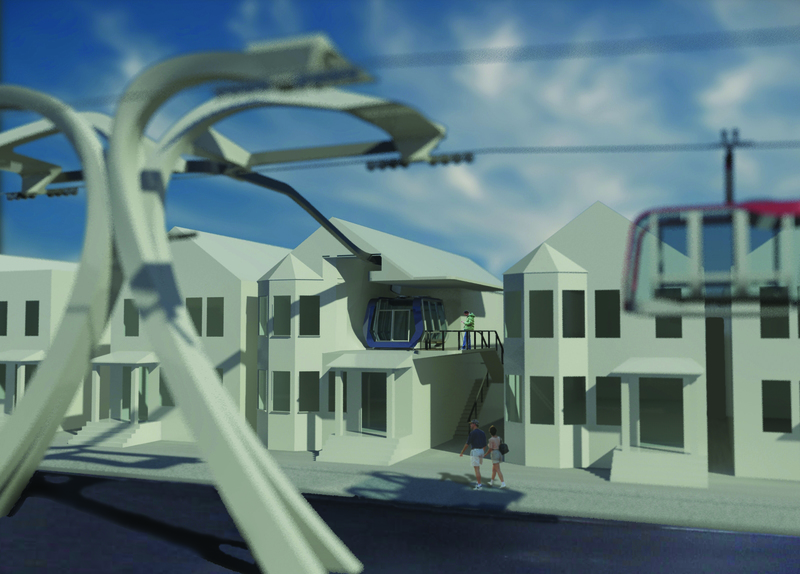 Rentals of gondolas into the transportation system would help finance the housing project as part of the greater infrastructural intervention in the city. In this way, the connection between domestic life and urban transportation are linked both mechanically and economically. 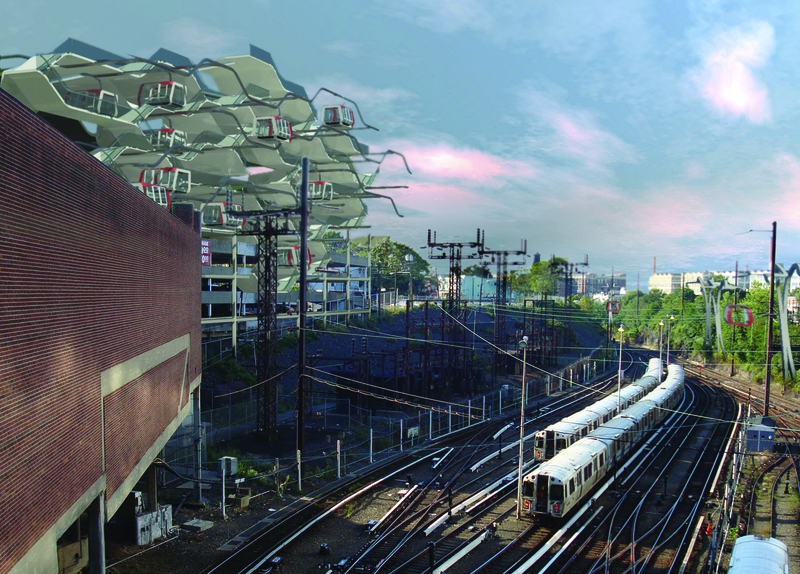 The housing block is a flexible structure composed of tracking systems and free platforms (arranged to optimize light and air access). All households are accessible through a distributive track at the street facade of the building. 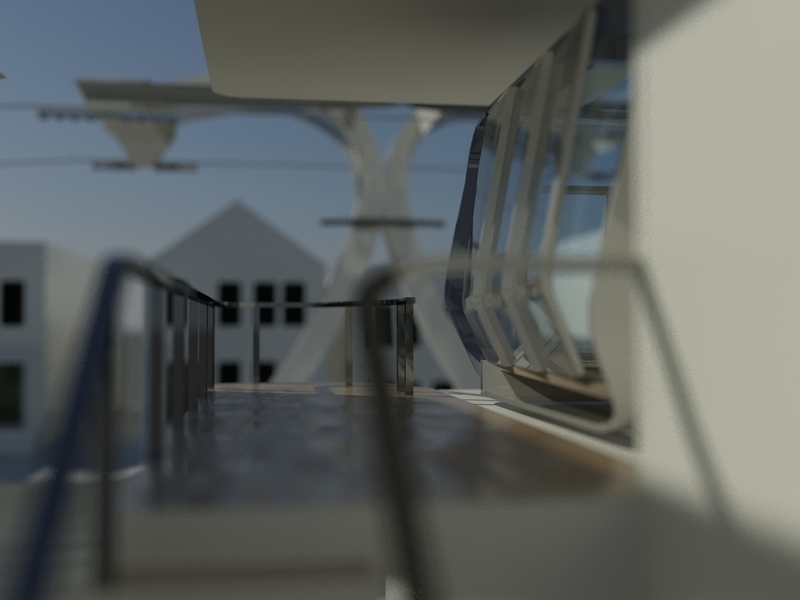 Additionally, pedestrian access is provided by the stairs on the platforms and the porch funnels that stabilize the gondola into place. Upon entry, the gondola meets the container(s) it selects, and once engaged, the unit is stabilized. Households may stack longitudinally as many gondolas as they want (even in two side-by-side rows). When the use of the gondola is consumed, it is either rented to a neighbor or released back into the transportation system. The containers are then stowed away on tertiary tracks to allow for maximal uninterrupted space to be opened up to the public. With this type of infrastructure that narrows the gap between transportation and architecture, the streets-cape is entirely transformed. The experience of the city is now three dimensional and constantly changing since the built environment is, itself, constantly transforming. People are now endowed with increased control over their use of space and since their economic incentives are complimentary to the social benefits of the city (more open space), urban improvement is a certainty. 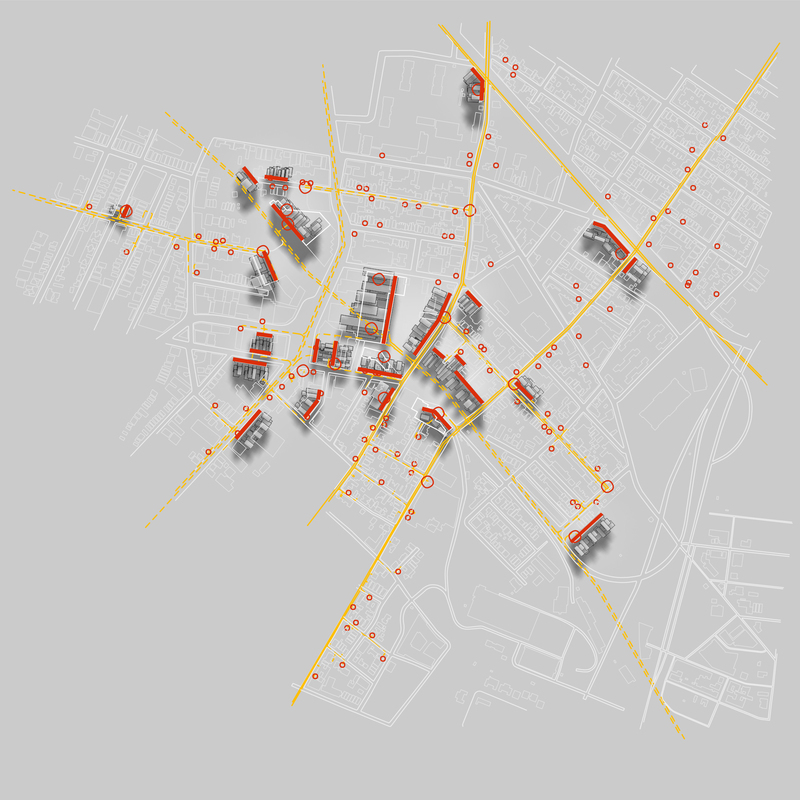 Contemplating the need for the exchange of space in the different urban archetypes of the city, we tested the infrastructure on existing buildings in the Jersey City topology. The merits of each intervention are evaluated by its satisfaction of the following criteria: Urban, Economical, Technical. Alleviating Private Income Finances With the recent mortgage market crash, it became evident this archetype is a financially fragile one. But a house facing foreclosure could use the gondola system to help pay the mortgage at the end of the month. A slight modification to the house and the installation of a two-tower mid-street derailment assembly facilitate the continual use of the actual space as before, only now with the possibility of renting out the space. This intervention also provides a public station for use by all residents in the region. Jersey City’s disparate urban archetypes have both shaped the gondola housing project and been adapted to accommodate it. Together with this new infrastructure, the city functions as a coherent and dynamic system of space flows and exchanges. The interdependence of this urban approach brings not only existing structures to higher efficiency, but also the cost of urban space. The more destination for the gondola to go to as a mode of transportation and the more uses it could have within the different archetypes, the stronger and more stable the economic model gets. In this way, the economic and urban strategies buttress each other. The more destination for the gondola to go to as a mode of transportation and the more uses it could have within the different archetypes, the stronger and more stable the economic model gets. In this way, the economic and urban strategies buttress each other.